Tonight we saw the end of an era; tonight we saw a bit of history flutter from our eyes and fade into the transient light that makes up our campus. We said goodbye to Myles Standish, Shelton Hall and Towers Dining Rooms for the last time tonight, though it may be corny it was like saying goodbye to an old friend. For a lot of students these three dining rooms were their first experience as a college student. Their first meal that wasn’t prepared by Mom or Dad, their first meal where their family wasn’t sitting around them talking about their day, to most that could be a daunting experience, but for some it was their first step into adulthood. It’s that first step that you have to take, and it’s usually the hardest one to take, but when you entered a dining room like Shelton, it was made pretty easy for you. We loved opening Shelton dining room in the morning when no one was there, it was quiet, you looked out the window to the mist rising off the Charles and a sort of peace would come over you, just for a split second because soon that room would be filled with students just starting out their day. Once the room filled up you were transported back to what it must have been like 60 years ago when it was hotel. The ornate doors, the mirrors, and you could imagine Eugene O’Neill stopping in for a bite before returning to his room to do some writing. The room captured that history, sure it’s been modernized, but if you squinted enough you could see that past. Dean Elmore always talks about how we must always strive to build that sense of community on this campus; Shelton couldn’t have been a better example of what he was talking about. From the cooks to the cashiers you felt a part of that community the moment you walked in. You took that first step into our dining room and we welcomed you, the college welcomed you, the history welcomed you, that won’t ever leave your memory. Just a block away you have Towers dining room, sure it was in the basement, there were no windows, it was the largest on Bay State rd. but from the time you walked in it got a lot smaller. 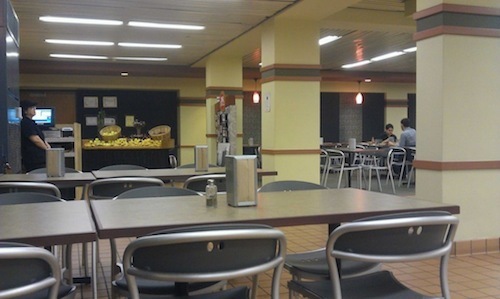 Not because it was crowded, but because it was full of students just like yourself, eating and talking and sharing. The dinner table is that last bastion of togetherness that a lot of times we take for granted. We’re always in a hurry to go here and do that, tweet this and Google that, but taking an extra 20 minutes with friends is a struggle for most. At Towers we tried to instill that togetherness, the staff there was one of the best on campus, they made it their goal to make sure you ate, but not just ate, shared, enjoyed, relaxed and laughed. We hope we got it right for some of you. She was a grand hotel in her day, shaped like a ship, named after an explorer and right in the heart of Kenmore, she was Myles Standish Dining Room. You want to talk about being transported back in time, walking into Myles does that in an instant. The wood paneling, the elegant chandeliers, the expressive murals, it had it all. Some say it was out of date for the 21st century, they may be right in some aspects, but most people wouldn’t have changed it for a second. It wasn’t easy to navigate with it’s three separate seating areas and maze like layout with the food stations, but after your second visit you could do it blindfolded. We used to have a cook their named Jack who for years was the grill cook, he’s since retired but on a Sunday morning you could here old Jack from out on Beacon St. He would be flipping those omelets, playing his jazz music and singing along teaching the freshman a few things about music. And he knew everyone, and he knew everyone’s order as soon as they walked in, that’s what Myles was. Yes the building was historic and had that trace of elegance, but it was our employees that made Myles what it was. From Natercia the cashier giving you that smile when you entered, just making any bad grade go away; from Juan that gentle giant in the morning with his wonderful spirit to the baker Sonia who made the best cheesy bread that would rival any restaurant. Those employees made Myles what it was, and we hope that got across to the students. But now we say goodbye, we are sad of course to see those dining rooms go, but we can’t help but feel optimistic. The new building going up at 100 Bay State is going to rival any dining facility across the country, we guarantee it. President John Kennedy often liked to recite this quote; “Change is the law of life, and those that look to the past or present are certain to miss the future”. Yes, there is change coming on Bay State road, it is a law of life, but by taking what we have, our employees and folding them into that new change, there is no way we’ll miss the future. We just can’t wait until we can share with you again, it is that sharing, that community, that relationship that we will continue to foster and build with you in the new building, we can’t wait for you to join us on this new adventure. As the semester begins to wind down, it become difficult to even fathom any thoughts of next semester, but last Thursday night the dining halls did just that and introduced all BU students to the dining fare that will be available in the new East Campus dining facility next semester. Thursday evening, the dining halls across campus were packed with students ready to try out the new menu. From flat breads and crepes to burgers and assorted desserts, it seems like the dining hall at 100 Bay State Road will have it all. Many students even sampled more than one dish, as there was such a wide selection to choose from. Some favorites included the flat bread pizzas, grilled chicken crepes, mac and cheese, and the Bay State Burger. However, the biggest hit of the night came at dessert with mini cheesecakes and chocolate fondue. The dining hall staff even wore hard hats and vests, reflecting the construction at the East Campus Center site. With the preview of the new campus dining well received by students, it seems like BU Dining Services is on the right track to delivering tasty and satisfying menu options for students next semester. Thursday evening was Meet the Chef night in the dinning halls around campus. 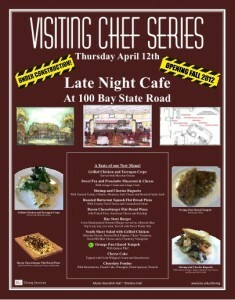 Chef Al Nelson of Myles Standish Hall was the featured chef of the evening. Originally from McCalla, Alabama, Chef Nelson made one of his southern favorites for us all to enjoy. The featured dish included Sweet Chili and Honey Fried Chicken, Pork Belly Orecchiette and Cheese, and Roasted Vegetable Medley. The fried chicken was delicious- perfectly tender and juicy, with crispy and flavorful skin. The sweet chili sauce was a nice complement to the chicken and added great flavor. The Orecchiette pasta, (whose name comes from its shape, is Italian for small ear) and cheese, was a unique twist on your typical mac and cheese. The cheese was creamy and was mouth-watering. Last but not least, the vegetable medley was a great change of pace from the usual veggies served in the dining hall. 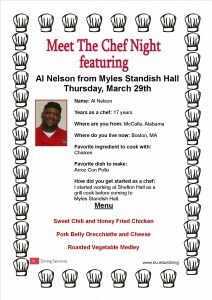 Chef Nelson’s dish on Thursday evening was a big hit, (I even saw a few students going up for seconds) and I’m so glad that he was the featured chef of the evening. 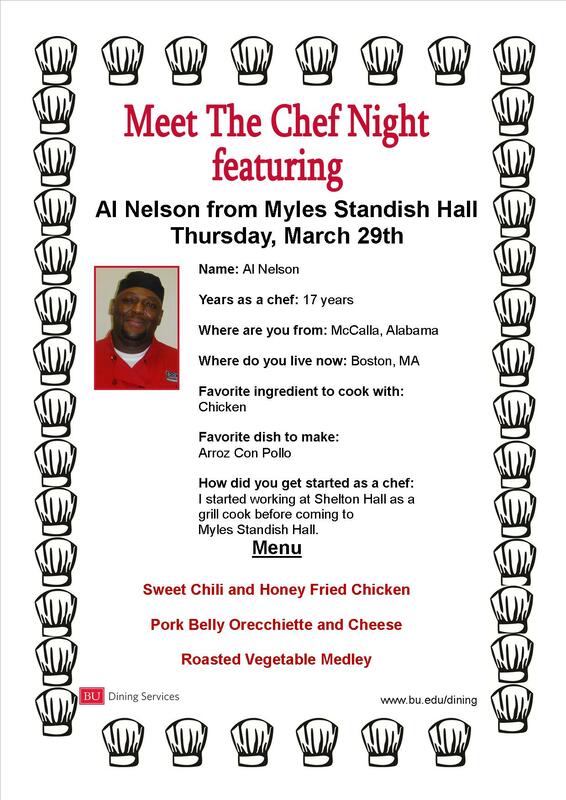 I can’t wait to hit up Myles Standish Dining Hall soon to try Chef Nelson’s cookin’ again. Thursday night was Sargent Choice Night in the dining halls, and who doesn’t love Sargent Choice night? I mean, a guilt free dinner (well at least for the most part) and with plenty of new and exciting choices, Sargent Choice dinner is one of the best nights in the dining hall. Some favorites this time around included Steak & Cheese Sandwich, Chicken Taco Salad, and Spinach & Artichoke Dip. I tried the Chicken Taco Salad and the Spinach & Artichoke Dip, and they were both delicious. The Spinach & Artichoke Dip was so popular that the carrots and veggies that accompanied the dip were all out by the time I got to dinner, but the pita chips that they served were crunchy and great scoopers for the dip. My favorite dish of the night was the Chicken Taco Salad. The cilantro lime salad dressing is what really set it apart from other taco salads that I have had. There was a great kick from the lime that added a pop of flavor to the chicken and salad. Finally, as expected, Sargent Choice night included a few fantastic desserts. The cheesecake with the berries was definitely a favorite among diners in Warren; the staff could barely keep up with the rush of students! The berries served with the cheesecake were definitely what made the dish a hit, as the berries were another friendly reminder that spring is here! Additionally, the apple crisp with granola topping was a winner. Overall, I think that all enjoyed Sargent Choice night, and I know that I’ll be marking my calendar for the next one. 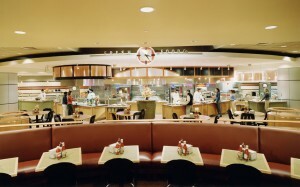 University Grill & Pizza and Sal’s Pizza are two popular family-owned institutions located on Boston University’s central campus. 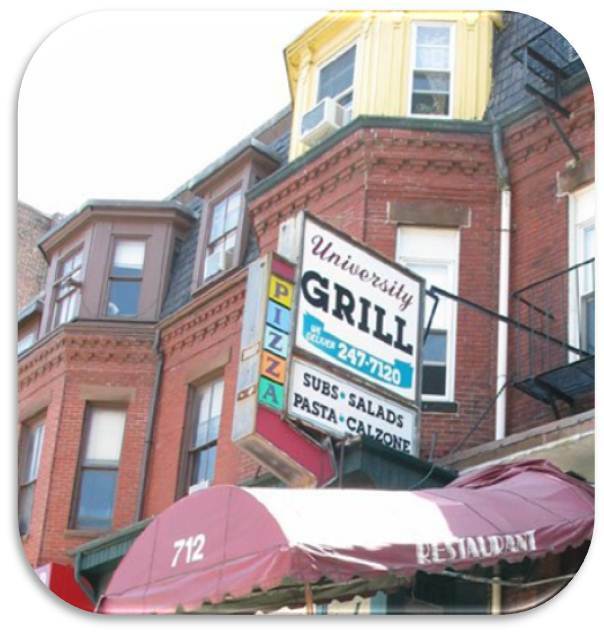 University Grill also known as “UGrill” has been open since 1960 and is currently run by four brothers and offers an extensive menu from pizza and salads to Gyros and wraps. Sal’s pizza specializes in New York Style pizza offering slices that are each a quarter of the pie with specialty pies ranging from Quattro Formaggio to Meat Lovers. I went to both pizza places to try them out for myself and see how the pizzas stacked up against one another. University Grill & Pizza was the first on the agenda. Decorated in sports memorabilia UGrill is the perfect spot for any Boston sports fan to hang out. In regards to the menu there were a variety of options but I choose to stick with the pizza so I ordered a cheese pizza. The pizza was made to order and came fresh out of the oven minutes after I ordered. The crust was of medium thickness and topped with fresh tomato sauce and gooey cheese. The pizza was a bit greasy for my liking and rather heavy on the sauce. Although this pizza might not have been my favorite, the service was fast and the brothers were appreciative of my service. Overall I don’t think I’ll be returning to UGrill for a pizza, however I would be interested in returning try the Gyros and sandwiches. Moving on to Sal’s Pizza, I decided to swing by around lunchtime and give it a try. Known for their pizzas by the slice, I knew I wouldn’t be able to turn down the chance to try the “Biggest Slice on Campus,” so I ordered a slice of Sal’s famous pizza. The pizza’s are made fresh in house and put on display ready to be chosen and served up by the slice. After being ordered, each slice is then heated up in the oven for a few minutes and comes out hot and bubbly. The crust was very thin, just the way I like it, and had an even amount of sauce and cheese, neither overwhelming the other. Although Sal’s only serves pizzas, calzones and salads you will never feel like you are missing out. With several specialty pies and numerous toppings to create your own pizza there is something for everyone at Sal’s. The pizza that I ate at Sal’s Pizza was by far my favorite from the two establishments. 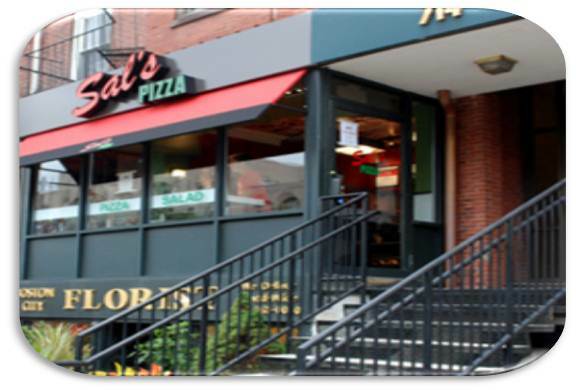 We are lucky to have both University Grill and & Pizza and Sal’s Pizza located on our campus but for me the thin crust, non-greasy pizza and extensive toppings choices sealed the deal making me a Sal’s fan. If you are like me, then I am sure you will agree that it’s getting to be that time in the semester where your go-to standby meals in the dining hall just aren’t cutting it anymore. Luckily, BU Dining Services is working hard to make sure your taste buds are entertained by offering special meals across campus dining halls to help break the monotony. The Meet the Chef series has been happening in every dining hall throughout the year and is giving the executive chef of each dining hall to showcase a dish of their choosing. 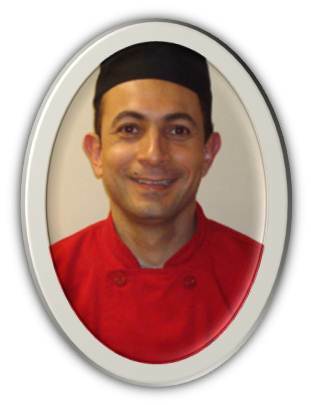 On Wednesday, Spanish flavor came to Shelton Hall as Chef Carlos Parejo brought his Colombian background to diners. His breaded pork chops with Spanish rice and fried yucca topped with a shrimp cream sauce were a unique treat for diners looking to break out of their typical salad bar or pizza routines. 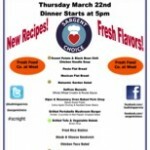 The next Meet the Chef event will be on March 7th at Warren Towers if you missed out this time. Whether it is Make a Difference Monday or the Student Iron Chef competition, BU Dining Services is always striving to offer new and interesting dishes and provide students with plenty of delicious options whenever hunger strikes. We are very lucky here at Boston University to have the GSU on campus with so many great options for dining in the food court. 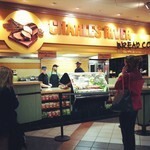 One of my favorites is the Charles River Bread Company and the variety of sandwiches they offer everyday. I really love the “create your own” sandwich option and usually take advantage it when I visit the Charles River Bread Co. My go to “create your own” of choice combines basil pesto, grilled chicken, fresh mozzarella cheese, and romaine lettuce all on a whole grain ciabatta roll. It is just delicious! The basil pesto is so yummy and adds an extra layer of flavor to the chicken sandwich. Plus the romaine and pesto also add fantastic color to the sandwich that make me want to dive right in and take a bite. The ciabatta rolls always taste so fresh and are crispy on the outside and fluffy on the inside. 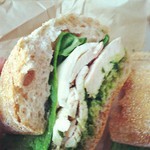 This sandwich is one of my favorites and after trying a few other selections at the Charles River Bread Co. I always find myself gravitating back toward it. So what are you waiting for… give it a try! The newest retail offering at the GSU is serving up personalized Asian cuisine for daring diners. Bowls & Rolls offers exactly what it says: Bowls, as in Vietnamese pho noodle bowls and rolls, as in sushi. I visited Bowls & Rolls at the beginning of the year and was surprised by the variety of options available to students. There were many different sushi options including classics like the spicy tuna roll and the California roll as well as unique creations like the B.U. roll. 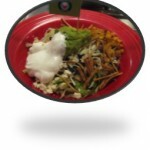 The noodle bowl is customizable, offering diners a chance to be creative and make their own dish. Customers pick their broth, noodle type (soba or udon), five additional vegetable toppings and you can add meat to it as well. Unfortunately, I could not try the noodle bowl since I am a vegetarian and Bowls & Rolls doesn’t have vegetable broth. Perhaps they will change this is in the future because I would love to try one! However, I did try the avocado and cucumber roll and I really enjoyed it. I loved watching the sushi chef prepare my meal in front of me and of course eating it was even better. Have you tried Bowls & Rolls yet? People love to complain. Whether it is about the weather, how much work they have to do or how annoying their roommate is, people are always whining about something. I often hear students (and sometimes myself) complaining about how much they are sick of the dining hall. However, all that it takes to stop the grumbling is a trip to another campus’ dining hall to realize how lucky BU students truly are. First of all, most schools only have one dining hall and maybe one or two retail options and coffee shops. BU has five dining halls, all with online menus, so you can get exactly whatever food you are craving. And not to mention the food is absolutely divine. Seriously, have you been to the Fresh Food Co. at West Campus? Few other schools serve meals that include such high class options like rosemary polenta and BBQ brisket. BU Dining Services also offers almost 30 retail options, including three easily accessible Starbucks! Most of my friends who attend other schools would die to have Starbucks every day, but for BU students, it is an easy reality. So stop complaining! Be happy that your meal plan includes many options and does not force you to subsist on Ramen noodles, Oreo cookies or whatever your mom can include in a care package. To have more cooked vegetables at lunch and dinner. I am very grateful for the dining halls we have on campus and for all the great options they provide each day, but I feel like one of the main things that I am always searching for is more vegetables. Now how many times do you here a person say that?? I like to eat healthy foods and I believe the dining halls try to provide many fruits and veggies and are pretty successful at doing so. Yes there is the Salad Bar and the occasional Mongolian Grill station with veggies to be cooked, but I think there should be a station with just cooked veggies! I’m talking red and green peppers, eggplant, broccoli, snap peas, green beans, zucchini, and asparagus… you name it! There is usually one cooked vegetable served with the main entrée at the dining hall, but a greater variety would be fantastic. I always really enjoy the mixed veggies at the Cranberry Farms station in the GSU, and I think that something like this could be added one day to the dining halls. 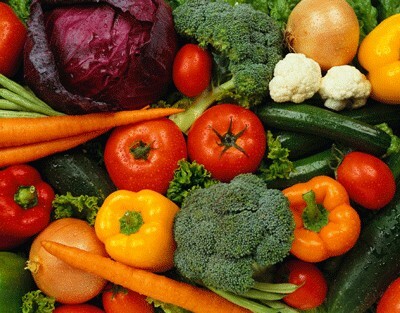 To make BU an even better home away from home than it already is more veggies could do the trick!